11 thrilling miles of slush covered roads and trails. 11 miles of the sound of dog paws striking the ground. 11 miles of trails lined with excited Iditarod fans cheering on their favorite mushers. 11 miles listening to sled runners gliding across slush, snow, mud, and concrete. 11 miles I will never forget. This morning 4th Avenue was lined with dog trucks, dogs, mushers, IditaRiders, fans, and many volunteers. The excitement has been building for months. Today was the day fans have been waiting a year for. 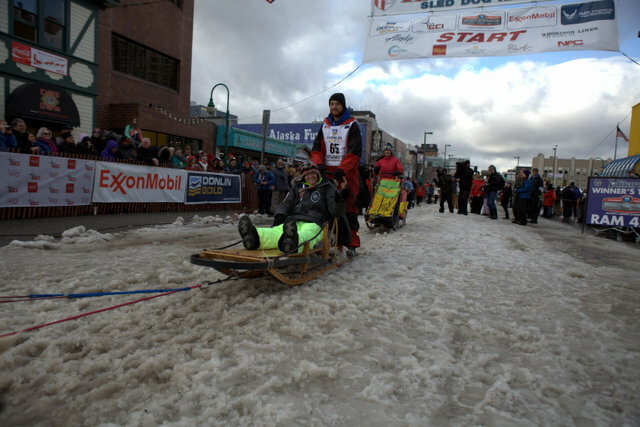 Fans had the opportunity to walk the streets and snap pictures of their favorite mushers and enthusiastic dogs. Off we went down the trail. Fans lined the streets cheering Wade on. He tried hi-fiving as many people as he could. He even got off his sled and ran along side of it to reach out and hi-five some youngsters. We rode past a few stops that were passing out hot dogs, Wade grabbed one. A group of college kids lined part of the trail screaming and cheering mushers on. A little farther up the trail people dressed up as pirates and were cheering on teams. A few parts of the tail were peaceful and quiet. We curved around trees, barely made it past a telephone pole, and snuck through tunnels. We exited the wooded trails and were suddenly on the airstrip. A burst of wind came out of nowhere. Wade laughed and said, “this is what it feels like on the coast.” A short ways down the airstrip we finished our ride of a lifetime. My ride was definitely a ride of a lifetime. I am honored to have been given the opportunity to ride in Wade’s sled. Last year he finished 16th in the Iditarod and is looking forward to improving last year’s finish. I am looking forward to seeing him out on the trail and cheering him on. Next up, “the trail.” My flight leaves for Fairbanks tomorrow (Sunday) at 4:00 p.m. Many mushers began their drive to Fairbanks immediately after the Ceremonial Start while others will head up in the morning. Follow the mushers along the trail using the Iditarod Insider GPS tracking system to follow the mushers and me.